Grobetrotting With Jeff: the Penultimate Letter - The Terracotta Warriors - It's the Pits! Despite the fun yesterday of the Wild Goose Pagoda, the bike ride around the city walls, and the exotic Muslim Quarter, the main reason for coming to Xi’an is the Terracotta Warriors. Once again, our guide Feng gets us up early so we can be the first people through the gates when the doors open. 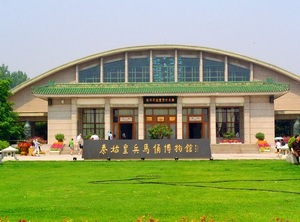 The Chinese have built a large museum complex around the four pits that constitute the actual site. Three of the pits have been excavated and the fourth pit is said to be empty which feeds my friend Barb’s conspiracy theory that the Terracotta Warriors are a scam. She claims they are actually only about thirty years old, created as, Donald Trump might say, as “Fake Tourism.” There are actually robot machines inside pit four churning them out. But then again Barb believes that bananas actually come from outer space since there is no fossilized evidence of them existing on earth before 1975. Whatever the case, the museum complex is impressive, and it’s supposedly only the tip of the riceberg… sorry iceberg. It’s a small part of a huge necropolis. The circumference of the outer city is a whopping four miles. You can see the actual tomb – if the smog conditions are “just right” from the Terracotta museum. In 2012 the remains of an “imperial palace” that was estimated to be 690 meters long and 250 meters wide – nearly a quarter size the Forbidden City in Beijing was discovered. The Terracotta Warrior site was only a “military outpost” built to provide protection for one flank of the necropolis. It boggles the mind to figure out how long you’d have to stay to see the whole necropolis if they ever decide to dig the whole shabang up -but for now the Terracotta Warrior complex will have to do. The warriors were constructed 2200 years ago by the first emperor Qun Shi Huang and were supposed to be an afterlife army for him. The ancient Chinese believe that objects like statues can be animated in the afterlife – sort of like a scene out of Jason and the Argonauts or Hercules vs the Smog Monsters. The emperor needed a huge clay army to protect him. 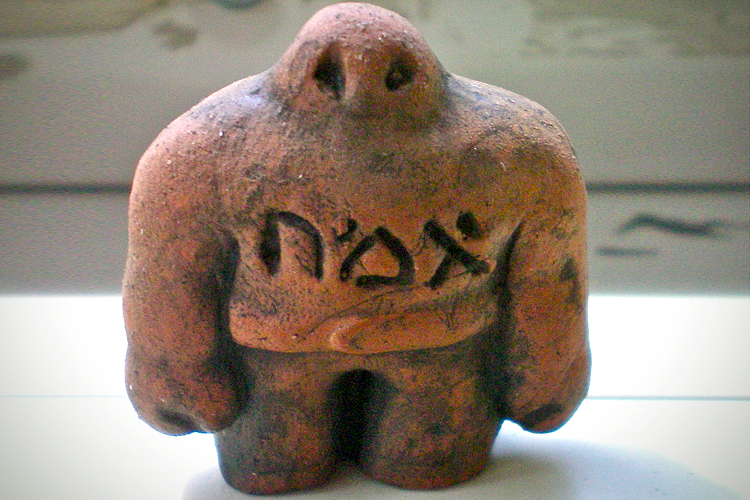 We Jews did it with just one – a golem. Feng tells us it took over 40 years for over 700,000 laborers working around the clock to create the more than 8000 statutes. Interestingly enough, that’s about the same number of laborers it would take to make the 8000 pairs of Nikes. In 1974 the State Administration of Cultural Heritage began excavation under the supervision of brothers Hum and Dum. The Tee brothers were commissioned to dig up the site and put all the emperor’s horses and men back together again. They’re still working at it. The first pit we enter is imaginatively named “Pit One “- it’s huge – about the size of three football fields. The soldiers are lined up like dominos and I’m wondering what would happen if I could just reach out and give one them a “slight” nudge. I see Feng eyeing me nervously. 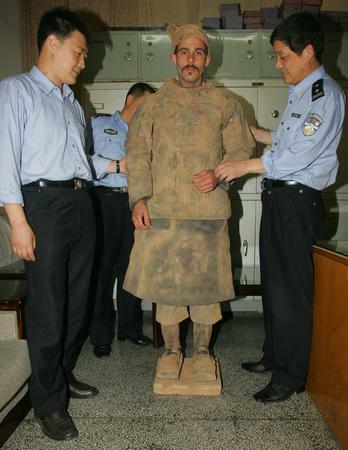 A few years ago a German student painted himself grey, dressed up like a Terracotta Warrior, then snuck down into the pit when no one was looking and gave the staff and crowd quite a scare – probably for the Chinese version of “Just For Laughs.” However the soldiers who arrested him weren’t in on the prank and the guy was deported in a container of Gucci knockoffs. Supposedly no two soldiers are exactly alike each has distinct facial characteristics. Quite an accomplishment when you consider there are over 8000 of them. I’m guessing after each artisan used up his own family and friends for models things might have become a bit more challenging. I imagine the following conversation might have taken place between several of the sculptors during one lunch break. At this point Zhao shows up. “Wang the Barber,” replies Li. “Do you think the emperor would believe triplets?” asks Li. Pit One contains the infantry and cavalry. The smaller Pit Two houses the war chariot divisions. There are guys posed behind some of the horses and I’m told they are charioteers, but I swear some of them are holding shovels. Pit Three, the smallest of the pits, is thought to be the command post containing high ranking officers and a war chariot. They are still looking for the terracotta briefcase that has the codes for the terracotta nuclear missiles. After an hour or so of taking in the sights of the terracotta warriors we meet back near one of the gift and souvenir stands – of which there are many. Our guide tells us that Terracotta warrior souvenirs are like Rolex knockoffs – there are different qualities – you have to be careful which ones you buy. Definitely stay away from the playdough warriors. I look in vain for a t-shirt that says “Visit the Terracotta Warriors…. They’re the pits!” I suggest this to one of the venders who says something to Feng that makes her blush. Our next stop is a Terracotta Workshop where they make Terracotta figures and other handicrafts in exactly the same manner they used a thousand years ago! That’s if you consider that they had 3D scanners and printers back then. They actually have a 3D scanner at the workshop we’re visiting and, for a few hundred bucks, they’ll scan your face and build a terracotta version of you – horse not included. After our visit to the workshop, it’s time to head back to the train station to catch the Shanghai Cannonball. I’m assigned the same cellmates – and we settle in for the 14 hour overnight ride to Shanghai. The good news is we’re told that this train has a dining car! The bad news it’s catered by the same kitchen staff from the Hotel Dracula. Who knew there were so many versions of Gluttonous Bullfrog! I’m tempted to try the deep fried version, but opt for a giant bottle of Tsingtao beer instead.